Disability Benefits – For people of working age (16-65) we provide information on how to claim disability benefits, including advice on entitlement to Personal Independence Payment; Disability Premiums; Employment and Support Allowance and the Work Capability Assessment. Specific help is available with completing a Personal Independence Payment form, which is arranged on an appointment basis. Older Peoples’ Benefits – We provide Benefit Checks for Older People taking account of their possible entitlement to: Attendance Allowance; State Pension and Pension Credits. Specific help is available with completing an Attendance Allowance form, which is arranged on an appointment basis. We can also arrange benefit check appointments for people aged 65 and above living in the Edinburgh area. Benefit reconsiderations and appeals – Although Grapevine cannot represent individuals with appeals we can advise on challenging benefit decisions, including how to request mandatory reconsiderations initially (a template letter is available), and if unsuccessful how to lodge an appeal with Her Majesties Courts and Tribunal (HMCT) service. Financial grants and money – We can provide a list of charitable trust funders, who may be willing to help individuals pay for things like furniture, household goods, disability equipment, holidays and general living costs. We have a leaflet on VAT relief for disabled people. Other financial information includes: heating grants/allowances and financial support via local authority schemes such as the Scottish Welfare Fund and Discretionary Housing Payments. Access to Transport – Grapevine provides information on all aspects of transport, including entitlement to the: Scotland wide Bus Pass, Taxicard, Blue Badge for parking, Disabled Person’s Railcard, Motability Scheme and Road Tax. The information service also provides advice on access to travel by train, bus, plane, car and ferry. Social Work Services and Direct Payments – advice on how to access social care support and Self-Directed Support (SDS) options available, including Direct Payments. We also produce an up-to-date List of Care Agencies in the Lothians. We provide referrals onto LCiL’s Independent Living Team for specialist advice and support with individual assessments, setting up packages of care and support and employing Personal Assistants. Housing and Adaptations – information provided on accessible housing, including advice on grants for adaptations, local housing suppliers, applying for social housing, renting, buying and supported accommodation. This includes information on support with cleaning, housework, gardening and housing repairs. Equipment and aids – we provide information on a wide range of disability equipment including local equipment suppliers, equipment available from the NHS, hire and purchase of powered and manual wheelchairs and assessment criteria for equipment. We also have a publication with Independent Aid Suppliers across Edinburgh and the Lothians. From our office we can provide individuals with RADAR keys of the standard fee of £3 or £3.50 (inc. P&P). Employment and Education – Grapevine provides information on employment including how work might affect entitlement to disability benefits, how to get support through the Access to Work scheme, including referrals to LCiL’s Access to Work project. We offer advice on employment rights under The Equality Act and where to go for specialist legal advice. We also provide information on education, access to local day and evening classes, support for disabled students and help with funding for studying. In addition we can refer disabled people and people with long-term conditions onto our organisation’s Living and Work Choices Service, which can offer them the opportunity to explore future options around employment, education or training. Holidays and Leisure – Information is available on accessible holidays in Scotland, the UK and abroad. We can access information on a wide variety of holidays/short breaks, including self-catering, hotel and guest house accommodation, adventure holidays, group holidays and holidays with care provided. We also provide information on accessible leisure and sports activities. Access Issues – We provide general information on improving access for disabled people to employers, organisations and individuals, including accessing the internet and technology for disabled people. If you are looking for information on where to get an Access Audit, how to meet your duties under The Equality Act, or how to improve access for disabled people, then contact Grapevine for more information. 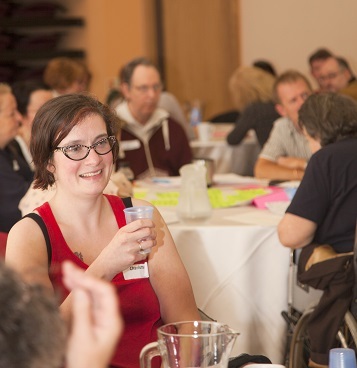 Grapevine has an updated guide on Accessible Meeting Places in Edinburgh and the Lothians. We offer specialist advice on providing accessible information and the Scottish Accessible Information Forum (SAIF) standards. Disability Equality and the Law – advice on promoting disability equality and good practice in ensuring that services are accessible to disabled people. We also provide information on the rights of disabled people under The Equality Act and information on where to get further advice if you feel that you have been discriminated against. We can also give you advice on how to access various organisational complaint procedures. Health and Personal Issues – Information on NHS services, counselling services, support services for people experiencing mental health issues and those in crisis, for example during relationship breakdown or bereavement. This includes information on self-management courses and impairment specific support organisations and groups, e.g: the MS Society, Arthritis Care, Parkinsons UK, etc. Grapevine is not an advocacy service, which means we cannot represent the person, write letters on behalf of, or contact agencies on behalf of the person. We will, however, refer and signpost people on to other organisations for support and to advocacy services where appropriate.